IT'S NOT JUST OUR JOB. Our team is passionate about artistry and craftsmanship. Every member not only has this passion, but is backed by years of experience. Our job doesn’t feel like work, because we do what we love – build beautiful windows and doors. No two are the same. Each has the personality and design requirements of the home it’s being installed in, varying in design, colour and detail. And that’s why our work is so close to our heart. Choose KV Custom Windows and Doors for design that will complement the architectural feel of your home and your personal style. Kevin Lev has a long family history in the window, entrance door, and patio door business. Involved since the age of nine, Kevin has worked in all facets of the industry. Starting as a general plant employee, he worked his way up to a management role. For over twenty years, Kevin has fine-tuned his skills, eventually working with Vince Berardi, and building KV Custom Windows & Doors together. Over the last sixteen years Kevin has focused on building a loyal team of dealers across Ontario who offer strong marketing strategies, total custom flexibility in product design, and a full range of common options, accessories and a 100% commitment to after-sales service. 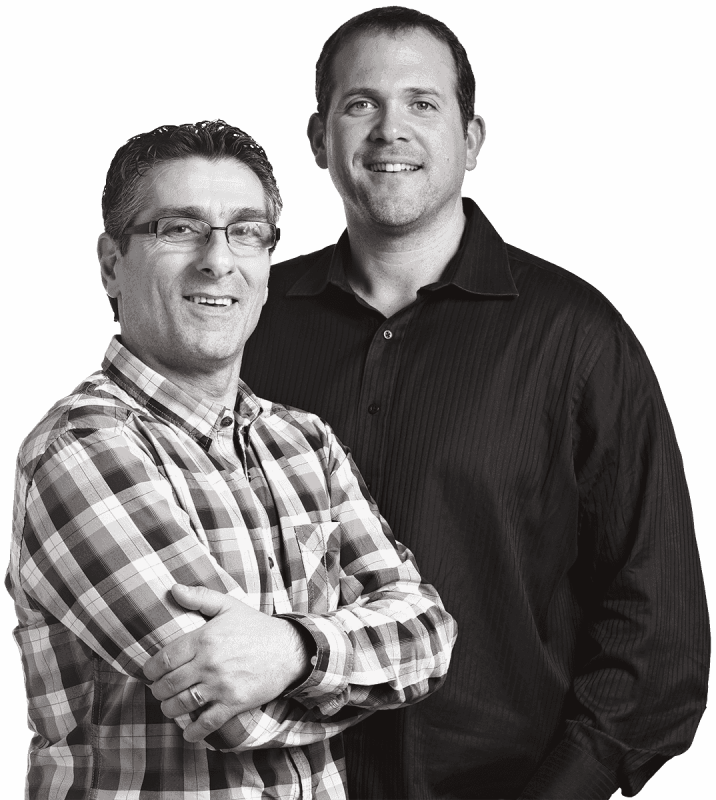 Vince Berardi has been involved in the window, entrance door, and patio door industry for over thirty-one years. During this time, he has witnessed the industry go through a number of changes, switching from aluminum to vinyl, manual production to automated manufacturing systems, and product focus to product integration. Vince has gained invaluable window and door knowledge, design skill, technical expertise and a commitment to quality-driven manufacturing, all of which has made him a respected and well-recognized leader in today’s industry. Vince’s passion at KV Custom Windows & Doors is evident as the company continues to develop and maintain one of the industry’s most efficient and lean manufacturing facilities. With a commitment toward Canadian-made products and state-of-the-art automated systems, he completely embodies the company’s mission statement: “Truth in Products & Relationships”. Ontario needs fresh leadership to guide us as we head toward stronger economic times. Leadership must come not only from our political figures, but also from the average citizen like you and me. At KV Custom Windows & Doors, we are committed to doing our part for the Ontario and Canadian economies and for all citizens. For example, we used to have many product components manufactured by overseas companies. Those factories provided us a good quality product, but we felt we could build an even better product for our customers by using modern Canadian technology, Canadian and American raw materials, and our own skilled Ontarians. So, over the last year we brought as many components as we could in our windows and door systems back to North American manufacturers. As we set up our foundation, we take pride in knowing that our product will be made in Ontario, by locally purchased machinery and by people who live right around the corner. Our manufacturing facility is equipped with ten CNC machine centres, combined with a shift of highly skilled assemblers, dedicated to making products that live up to the quality and design standards you have come to expect. There is not another window and door manufacturer in Ontario committed to “TRUTH IN PRODUCTS & RELATIONSHIPS” like KV Custom Windows & Doors. We support local business by working with companies in the area: all of our CNC equipment is manufactured at Pro-Line Automation in Woodbridge, Ontario; our steel and fiberglass doors are manufactured by three companies in Ontario and Quebec; our window profile is extruded in Woodbridge, Ontario by Royal Group Technologies; our custom decorative glass comes from facilities in Burlington and Vaughan, Ontario; our raw glass supplier is Guardian Glass out of New York, New York; our water-based paint system is supplied by Evotech out of Montreal, Quebec, and the PVC resin is made by Georgia Gulf out of Atlanta, Georgia. At KV Custom Windows & Doors, we are also aware of our responsibility to the environment. We are proactive in controlling waste by recycling all unused raw materials from our manufacturing processes, including: PVC, Steel, Fiberglass, Glass, Paper and Cardboard, just to name a few. We are also using our relationship with Royal Plastics & Guardian Glass to design new products that will help reduce home energy costs. As you can see, we are dedicated to designing, developing and manufacturing the finest custom window, entrance door, and patio door products for our customers and their clients. We are passionate about supporting our country and province, ensuring that the rich history in manufacturing remains part of the Canadian infrastructure.